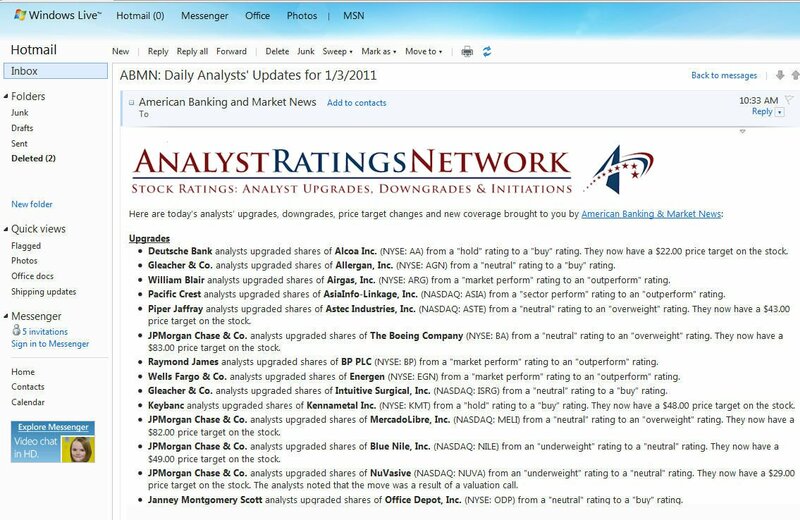 ABMN Daily Premium is a personalized and ad-free version of our daily newsletter that contains analyst upgrades, downgrades, price target changes and earnings estimates. Each edition contains an average of 200 ratings changes per day and is delivered at 10:30 AM E.T. Our premium newsletter service also provides a customized feed of ratings, headlines and earnings about stocks you select at the top of each edition. Premium subscribers also have the option of receiving an end of the day version of the newsletter that contains a wrap-up of ratings for the day. We will never sell your email address or share your email address with any third-party for any reason. Your email address will never be used for any purpose than receiving our daily newsletter. That’s our promise. Click here to view a sample of ABMN Daily Premium. Register through September 16th, 2011 and receive a 33% discount off ABMN Daily Premium for the life of your subscription. Regal Beloit Corp (RBC) Shares Sold by Thompson Investment Management Inc.